Recht gelungener, verträumter Song vom FMDH-Album. Relatief rustpunt op de CD Full Moon, Dirty Hearts.<br>Mooi gezongen ballade die na 2 minuten geweldig openbreekt.<br>Net iets minder dan hun vroegere ballades (Never tear us apart) maar zeer de moeite waard. The fourth release from FM,DH didn't even crack the Top 100. 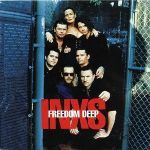 I bought it myself, so I know it WAS released, but a sad event in INXS history as this song is quite beautiful. Understandably, it probably wasn't really hit single material, but showed the band could still produce amazing music amid all the strife they were in.